We recently (and ashamedly) turned in our prognosticator’s badges, and are still puzzling over why this fall mushroom season has been – at least so far – such a disappointing one. The signs seemed auspicious and totally optimistic: a good, soaking rain in late August (2-1/2”, here), followed by warm dry weather, interspersed with occasional, additional rains. We could hardly contain ourselves. yard in downtown Port Orford. One of the most common and easy to recognize wild mushrooms we encounter are “Shaggy Manes” (Coprinus Comatus), and most people like them on the table (with eggs or on meats), so they’re well worth talking about here. popping up alongside Hunter Creek. We find them most often in gravelly areas by road sides, in late summer or fall. Less frequently, we’ll see them in grassy areas, but always (at least in our experience) in hard ground, as opposed to the loose stuff in which we encounter chanterelles and other fall favorites. They are striking mushrooms, tall and photogenic. The caps are described as “conic” in some of the literature, but that doesn’t seem to us to be quite right, except in older specimens that are already too deteriorated to gather. Rather, the caps are more like a tall, somewhat pointed oval, covered with frilly, lacy scales. They are normally off-white when fresh and prime, aging quickly to gray and black, often releasing a blackish, ink-like substance that you will be happier not getting on you. As a footnote, though, we purchased a lovely painting some years ago from a gifted artist and fellow member of the Puget Sound Mycological Society portraying Shaggy Manes which used shaggy mane ink as the medium! The point is that Shaggy Manes deteriorate very quickly, so if you gather them for the table, choose only truly prime specimens, refrigerate them as quickly as possible, and serve them that night or, at the latest, the next. Otherwise, they will almost surely have started to ink. 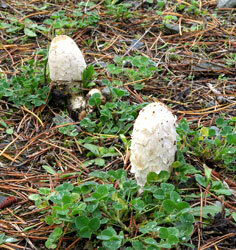 that the shaggy manes move through, from "bud" to "inky cap". I will share a story of an experience we had with Shaggy Manes some twenty years ago that was so shocking, we still laugh about it. Mary had gathered a few near her office, but after she got them home she realized they were a little deteriorated, and decided not to serve them after all. Instead, she put them in a small herb garden we had outside, growing chives, rosemary, basil, marjoram, mint and the like. Her thought was that perhaps the spores would drop and bear fruit there in the future, a not illogical idea. The next morning, she looked out at her herb garden, and was shocked to see the mushrooms still there, but literally every green thing in the garden laying flat on the ground, stone dead. We have no idea what conclusions to draw from this experience, but at a minimum, it tells you how not to discard unwanted Shaggy Manes! Shaggy Manes are among several members of the family called “Inky Caps” and share a family resemblance. 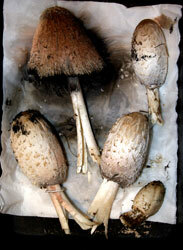 For most pickers, though, only one of this family is called Inky Cap, and that is Coprinus Atramentarius. It starts out dusky gray, and like the Shaggy Mane, ages quickly. It's always wise to eat any member of the Inky Cap "family," and for that matter any and all mushrooms new to you, in moderation until you're familiar with them. For example, some individuals have reported a negative reaction when consuming Inky Caps with alcoholic beverages. Temporary symptoms have included red ears and nose, light headedness, rapid heartbeat and nausea. Interestingly, these reactions are similar to those of Antabuse (Disulfiram), the drug sometimes given to alcoholics to make alcohol consumption an unpleasant experience. One other caution. Shaggy Manes often grow beside roads that are heavily traveled. It is always wise to think for a moment about where you are picking a mushroom you intend to eat. Well-traveled roads are likely to have had all kinds of stuff (oil, transmission fluid, and anti-freeze, for example) leaked onto their surface; when it rains, these pollutants get washed to the shoulders, where it can sink in and become a part of what you are thinking about picking. Areas that are likely to be sprayed with herbicides are another consideration. Our intention is not to scare you off eating a fine edible that is considered choice by most people, but rather to remind you to always be thoughtful in your mushroom gathering – and eating! And what else would you expect for the month of November! The chanterelles are fruiting all over the southern Oregon coast and we've selected 8 ounces of the freshest and best to dress up our Thanksgiving gravy! work well in this gravy! 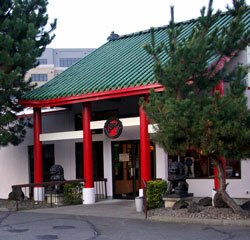 Of all the hypothetical locations that might occur to us for a truly great Chinese restaurant, Salem, Oregon wouldn’t be at the top of the list. Or the middle, for that matter. By this, we do not intend a slight to Oregon’s capitol. It’s just that in terms of its reputation as a mecca for Asian foods, Salem is simply not in a league with San Francisco or Seattle… or Portland, for that matter. Salem is a generally quiet, smaller city that lives deep in the shadow of the far larger city to the north, Portland; it isn’t close enough to be a legitimate suburb, nor far enough away to be truly independent. And while those employed by state government assure a restaurant of a certain “critical mass” of customers, it’s only when the legislature is in session (every two years, in Oregon) that local activity kicks into high gear. 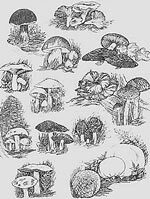 When we recently attended the annual fall exhibit / show of the Puget Sound Mycological Society, we were delighted to cross paths with many old friends, most of whom we had not seen since moving here to the southern Oregon coast ten years ago. One long-time friend has been a busy lady since we last saw her, and we would like to share her inspiring story with our readers. 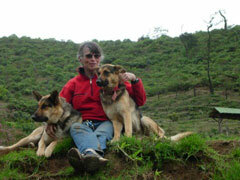 Sara and two of her best friends! November's off to an amazing start! Saturday, the 1st of November, was stormy, with about 2 inches of rain collecting in our Humbug Mountain rain gauge. Steven was a little under the weather on Saturday, while I was in an OSU Master Preserver Training all Saturday, so neither of us minded the nasty weather. 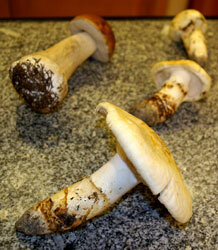 We hadn't been planning to go out gathering mushrooms on Saturday anyway- good thing, hum? Sunday, the sun came out, blue skies returned, and in the afternoon we collected remarkable quantities of boletus and matsutaki from the freshly rejuvenated forest floor. All specimens were in exceptionally good condition. What a great first outing of the year! We were on our way to the Puget Sound Mycological Society's fall show in Seattle. Why not stop on Mt. 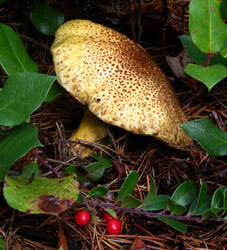 Hood and check out our favorite mushrooming sites. After all the rain that we've experienced, surely there would be mushrooms. So it was in mid October that we packed our bags and mushroom baskets into the Subaru and headed north.